We are a company that creates itineraries for motorcoach tours. 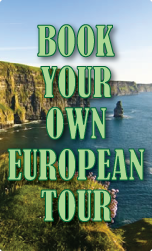 You can customize the tour or we can arrange everything for you. We'll do all the research! We have planned itineraries for New York City and all of the New England areas. All departures from these areas can be fully escorted with food service by our company. Give us your ideas and we will turn them into a delightful one day tour, or just sit back and let us do what we do best! Pricing for our itinerary services start at $200.00 and is due prior to the release of tour information. Once information is released to you, the fee is non-refundable.